The founder of Ashdown Hardware Co., Ltd. , James H. Ashdown, was born in England and relocated to Canada with his parents when he was a child. The business that grew into what was called the Ashdown Hardware Co., Ltd., was originally established as the Winnipeg Tin Shop in 1867. 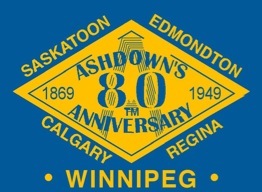 The date used on Ashdown Catalogs as the year when the company was established was 1869. Apparently it took two years before Mr. Ashdown decided to really diversify. During the next twenty years the company grew and became more and more involved in selling hardware and sundry items. By 1888 they had opened branches in Calgary and Regina. Subsequent branches were opened in Saskatoon and Edmonton. The company continued after the death of James Ashdown in 1924. Harry C. Ashdown, James' only son, then became the president and the company continued into at least the 1950s, maybe longer. Various markings used in catalogs and on tools marketed by Ashdown Hardware Co. The lower mark was stamped into the cheeks of some axes. Ashdown Hardware Co. procured the axes they sold from a full time axe manufacturer or probably more than one. That way they were insured a supplier if something happened with another manufacturer. 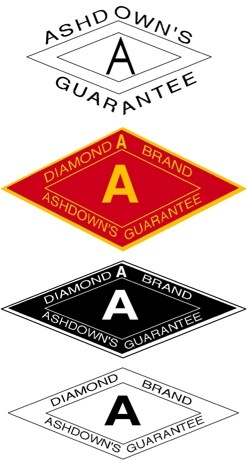 Representation of a paper label that was depicted in an Ashdown Hardware Co. Catalog. 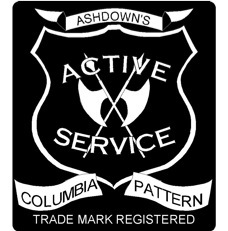 Paper label used on axes commemorating Ashdown's 80th anniversary. Stamped markings used on single bit axes.